Today, the UNPO, alongside Anti-Slavery International (ASI), Minority Rights Group International (MRG), and Society for Threatened Peoples (STP), is publishing a report to highlight the systematic failures of Mauritania’s justice system to provide redress to slavery victims. Despite apparent advances in legislating against slavery, the continued imprisonment of anti-slavery activist Biram Dah Abeid, whose appeal for release was denied just after the new laws were passed, demonstrates the government's lack of genuine commitment to change. This report comes just in advance of the Universal Periodic Review (UPR) Pre-session on Mauritania later this week, at which UNPO and IRA-Mauritania will give a joint statement, alongside SOS Esclaves and Anti-Slavery International. Despite the passing of an anti-slavery law in 2007, slavery remains widespread in Mauritania, particularly among the country’s large Haratine population. Those living in slavery are regularly beaten, intimidated, forcibly separated from their families and subjected to a range of other human rights violations, including sexual assault. 'Enforcing Mauritania's Anti-Slavery Legislation: The Continued Failure of the Justice System to Prevent, Protect and Punish', a joint publication by Anti-Slavery International (ASI), Minority Rights Group International (MRG), Society for Threatened Peoples (STP) and the Unrepresented Nations and Peoples Organization (UNPO), outlines the systematic failures of Mauritania’s justice system to provide redress to slavery victims. While the 2007 legislation contained a range of provisions criminalizing slavery, with specified penalties for its perpetrators, its implementation has in practice been obstructed by a persistent failure to identify or prosecute incidents of slavery. Drawing on a number of documented case studies, the report highlights how anti-slavery provisions are routinely violated at every stage of legal proceedings, with police, prosecutors and judicial representatives frequently refusing to process reported cases of slavery or take adequate legal action against those guilty of the practice. As a result, this abusive practice continues to flourish in a climate of impunity. Consequently, the approval in August 2015 of a new anti-slavery law strengthening the provisions of the previous legislation and expanding its definitions, though a welcome step forward, is unlikely to address the root causes of the practice without sustained commitment from Mauritanian authorities at every level. In addition, many of its provisions fall short of those recommended by the UN and human rights activists. 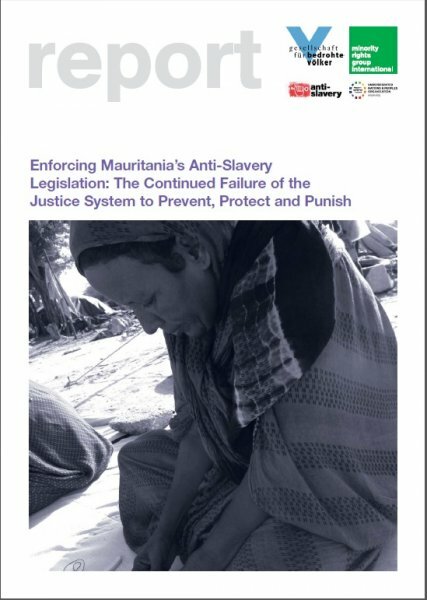 The report therefore outlines a series of recommendations to realize Mauritania’s commitment to eradicate slavery, with an emphasis on further legal reform, increased capacity for anti-slavery enforcement, training of officials, greater empowerment of civil society organizations and a comprehensive system of support for slavery victims. You can download the report in English, French, or Arabic.